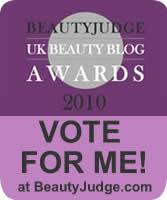 I'm so proud to be up there with all the other amazing bloggers that have also been nominated. I love blogging so much, i love telling people what i like and sometimes what i don't! I also love sharing all the lovely things i bought with my lovely followers. Blogging is great because it's a way of finding out about things you might not have ever heard about. It's also great to read people's honest opinions on items. Without blogging my world would not be the same! Every voter also can be in for the chance to win a huge make-up hamper!! I Already VOTED FOR YOU!!!! :) Good Luck!!! You deserve it! I voted for ya babe! Good Luck, Hope ya win! i follow you here, and in YT..
You're great... i talk of you on my blog (even if no one follow me!) .. Hope you don't mind!